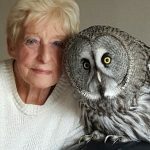 Forget arriving in a horse-drawn carriage, perching on Posh'n'Becks-style thrones or releasing doves: the must-have accessory for a truly magical wedding is to have your rings delivered by owl or hawk. The birds are trained to respond to our whistle and land on a falconry glove held out by the best man, the bird will then be treated with a tasty treat. Birds of prey don't come back for any affection. It's food they want. They know that when we whistle, if they come to the glove they'll get a reward. But this isn't a modern concept, falconers have long used birds of prey at their weddings. 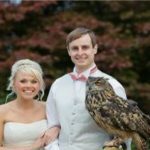 Their flight into mainstream weddings may be due to the charms of Hedwig, the snowy owl in Harry Potter. If you'd like more birds of prey at your wedding we can also put on a static or flying bird display. For more information on making your day extra special, please contact us.